I just finished my PhD in Biomedical Engineering at a joint program between MIT and Harvard Medical School. During the last 9 months of my PhD, my life could be summarized by: work, eat, sleep, and repeat. There were times where I didn't leave my apartment for days on end. It was a brutal schedule. I want to write about the work systems I developed during this period of time and how it can be applied to your own life. The Tomato Method is based around the Pomodoro Method, which consists of 25 minutes of work followed by a 5-minute break. I used a website called mytomatoes.com that (1) counts down these 25 minute increments, (2) asks you to write down what you did in those 25 minutes at the end of the time block, and then (3) records your answers so you have a log of how you have used your time. The website mytomatoes.com tracks the number of “tomatoes” (25-minute increments of focused work) you do per day. My goal was to get 16 “tomatoes” per day recorded on mytomatoes.com. When I got 16+ tomatoes per day, I put a solid red circle on a calendar that I had hanging next to my desk. When I got 10-15 tomatoes per day, I put an empty red circle on the calendar. If I got <10 tomatoes, I put nothing on the calendar. 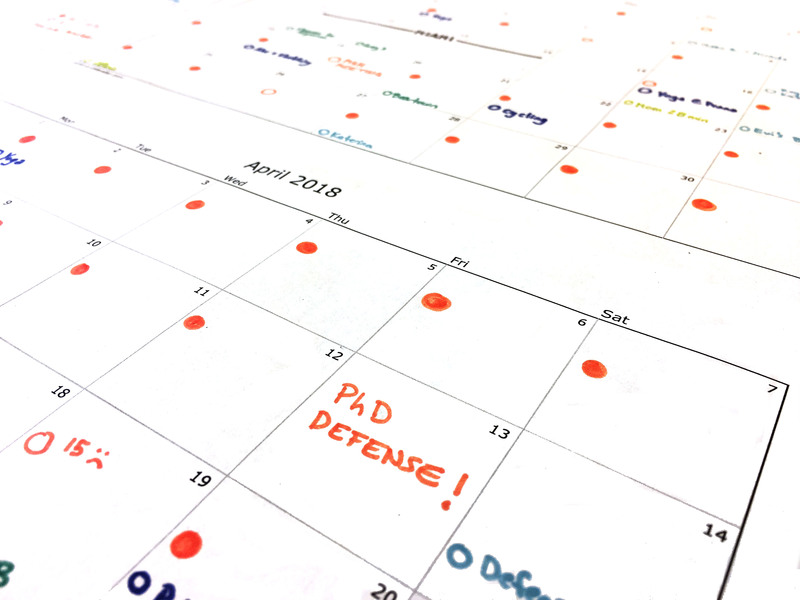 When I achieve 16+ tomatoes in the day, I put a solid red circle on my calendar. When I achieve 10-15 tomatoes in the day, I put an empty red circle on the calendar. This allows me to easily track my work schedule and productivity over time. The golden rule of this method is that the 25-minute tomato has to consist of pure work. If you find yourself going on Facebook or someone comes to chat with you or your work gets interrupted for whatever reason, you must “squash” the tomato and start over. The golden rule of the “Tomato Method” is that the 25-minutes must consist of pure work. If you get distracted or interrupted for whatever reason, you must “squash” the tomato and start over. Most people are surprised by how often these little interruptions come when they start tracking it. I almost always skipped the 5-min breaks and just refreshed the page to start a new tomato. I usually counted research meetings as 1 tomato regardless of how long the meeting took. Sometimes I did not count meetings as work. The hardest thing about a PhD is knowing how much to work and keeping yourself accountable to that schedule. Imagine waking up every day for 5+ years and needing to decide what to do, when to do it, how to do it… and then making sure you do it. At the beginning of my PhD, I relied of inspiration. I would sit in lab and do emails or other non-important work, and, consequently, not accomplish much real research. Then a deadline would approach and I pulled all-nighters to meet it. After the deadline, I would be exhausted and un-motivated and the cycle would repeat . Setting a target tomato goal helped me focus my day when there was no other structure. “Do I have time to go this cool talk?” Well it’s 7pm and I still have 10 more tomatoes to do before midnight. If I go to the talk, I won’t be able to finish my tomatoes. So no, I can’t go. “Do I have time to go get coffee with my colleagues?” I have 2.5 hours before I need to leave the office and just 3 more tomatoes left. So yes, I can take this break now. There were days where each tomato was excruciatingly painful. I could barely sit through one 25-minute session. There were other days where the tomatoes flew by. The key is setting the right tomato goal. 16 tomatoes per day is a ruthless schedule. Researchers have estimated that out of a standard 8-hour workday, most people only actually do real work for 3 hours. Doing 7 hours (16 tomatoes) of focused deep work usually took the whole day to accomplish. I would not recommend 16 tomatoes per day unless you need to be pushing really hard (i.e. to finish a thesis or prepare for an upcoming conference). A reasonable work-load if you’re on a maker-schedule is 10 tomatoes per day [3-4]. If you have multiple meetings or classes per day, 4-5 tomatoes might be reasonable. About 2 hours of true focused work per day is honestly more than most people achieve. • Use the Tomato Method every day and track the days you achieve your tomato goal on a calendar. • Institute one “no meeting day” per week and use the Tomato Method to add structure and accountability to your “free” day. • Set a low tomato count per day (3-5 tomatoes) and do them first thing in the morning. When there are too many weeks in a row where you haven’t achieved your tomato goal, it's a sign you might not be focusing on the “important but not urgent” work and may need to make a change to your life. Let me know what you think of the Tomato Method! How did it work for you? What methods do you use to keep yourself accountable? Sometimes I wrote detailed descriptions of what I did during each tomato and sometimes I didn't. When writing my thesis, I would record the word count I achieved during each tomato. Especially when writing, it is easy to let time pass by without actually writing words on the page. The tomatoes resetting at midnight was important for me because otherwise I would inevitably switch to a nocturnal schedule. This might not be as important of a feature for other people. Personally, I think an ideal work-load for a PhD student in the middle of their degree is 10 (non-email, non-meeting) tomatoes per day with 2 days off per week. The numbers might look different if you need to do a lot of experiments as it is harder to track tomatoes when you are busy away from your computer or phone. I am sure there are better Pomodoro-tracking websites than mytomatoes.com. One of the beauties of mytomatoes.com is how basic the site is. You can’t cheat it. You can’t edit your tomatoes after the fact (which can be infuriating when you have done 2hrs of work but forget to start a new tomato). The site doesn’t lie. Thank you to Sidney Primas for co-developing and implementing the Tomato Method with me as we both worked hard to finish our theses. I use the Pomodoro timer in my laptop all the time… such a good way to get things done and be realistic about the actual time we doing productive work. Thanks for sharing your insights! & congrats on the PhD, such a milestone!! !